THE STORY - Roland Deschain (Idris Elba), the last Gunslinger, is locked in an eternal battle with Walter O'Dim (Matthew McConaughey), also known as the Man in Black. The Gunslinger must prevent the Man in Black from toppling the Dark Tower, the key that holds the universe together. With the fate of worlds at stake, two men collide in the ultimate battle between good and evil. THE GOOD - Idris Elba brings a small bit of gravitas in a wasted effort. THE BAD - A bland story with one note characters. Very little back story. Mediocre action scenes. Largely poor visual effects. Matthew McConaughey chewing the scenery. ​Step right up, ladies and gentleman. I have a question. Have you been wanting a film based on a noted book series known for its rich mythology and deep characters? What if that book series was written by a legendary and prolific author? Now, imagine such a film had been made, stripped of its depth and richness, and replaced with something as bland as a saltine cracker. 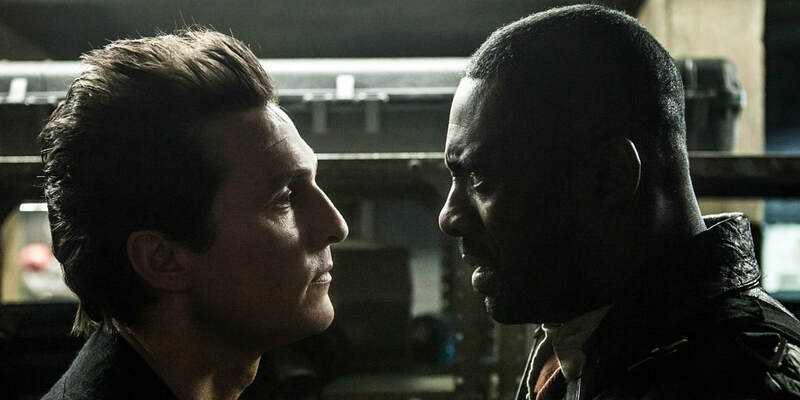 Well, that's “The Dark Tower” for you – a poor adaptation of the sprawling Stephen King book series. Jake Chambers (Tom Taylor) has been having visions in his dreams. These visions show a desolate wasteland, an evil man in black (Matthew McConaughey), and a noble warrior called a Gunslinger (Idris Elba). His mother and her boyfriend think he's just suffering from unprocessed grief stemming from the death of his father in the past. But Jake knows his dreams are real, especially when he travels through a portal to another world where he'll become a pawn in a war between good and evil with the fate of the universe in the balance. To say that “The Dark Tower” is dull and lifeless is almost giving it too much credit. The story sees Jake venture into another world, get taken under the wing of the grizzled Gunslinger, and travel around the wasteland looking for the man in black. It's basically taking the standard hero's journey, mixing in the foster father/son dynamic from “Lone Wolf and Cub”, and splicing in some fantastical elements like magic and demons in place of character development or world building. The Gunslinger's guns are forged from the steel of Excalibur. Because why not? Oh, and I mustn't forget to mention shine. What is shine? Shine is this universe's version of psychic powers, because why not also throw in psychic powers? There are also repeated instances of very corny or silly dialogue, particularly the multiple repetitions of “The Gunslinger creed”, as well as a reference to Jake as having “The biggest shine I've ever seen.” It took four different people including director Nikolaj Arcel and Oscar-winning screenwriter Akiva Goldsman (Or, as I prefer to remember him, the writer of “Batman and Robin”) to come up with such a limp screenplay. Unfortunately, on top of a thinly written plot, the characters are almost completely one dimensional. Jake is the special kid who can either save the universe or be used as an instrument to destroy it. Tom Taylor's performance is underwhelming and, despite his character being from New York City, Taylor's English accent slips through on multiple occasions. Roland the Gunslinger is the battle-fatigued fighter who has given up hope and is consumed by revenge. Idris Elba basically gives the film its single bright spot in the small level of gravitas he brings to the role. Walter, the man in black, is the evil sorcerer who wants to destroy the titular tower to break down the barrier between the worlds in order to destroy the universe. Though, I must ask – if Walter has magic powers that allow him to kill anyone he wishes instantly, why the convoluted business about destroying the tower and unleashing demons to destroy everything? Unfortunately, Matthew McConaughey also chews the scenery so badly and so often that it's very easy to laugh at the sheer goofiness of a character who is supposed to be supremely threatening. Jake's mother and her boyfriend are in the film for only a few minutes and don't matter save for one instance in act two that serves as just another “because the plot demands it” moment. There's also a seer in a village that Jake and Roland visit who seems like she should be important, but also disappears once the plot no longer needs her. While the plot and characters bring nothing new or interesting to the table, the action scenes could have made up for at least some of that dearth. However, the few action scenes we get are either over too soon to be enjoyable or are filmed at night, rendering several parts of it difficult to see. Of particular note is a scene where Roland fights off a demon that tries to hypnotize Jake into being captured. The CGI used to render the demon is ugly and the lighting is so poor that it's hard to make out what's going on sometimes. Additionally, the fight choreography is basically a Wild West version of the gun fu taken straight from “Equilibrium.” None of it is impressive or all that particularly captivating, especially in a film world where such action masterpieces like “The Raid” films and the “John Wick” films exist. In the end, “The Dark Tower” just has nothing of any import or value to add. Its story is chock full of cliches, tropes, and plot beats we've seen numerous times in other movies. The characters lack in much substance or depth. The action scenes don't provide any kind of enjoyment or freshness. And it wastes the talents of Idris Elba and Matthew McConaughey, as well as the source material from Stephen King. It's boring, laughable, and not a film I can recommend.